Social entrepreneur and National Geographic Explorer Sanga Moses' vision of providing Africa with clean and inexpensive cooking energy is not only helping the environment, but is also empowering his fellow Africans who play an important role in his innovative business. Sanga: Imagine if your sister or daughter had to miss school twice a week to walk 10 kilometers to gather wood for your family to cook with. Millions of girls across the African continent go through this every day. As a matter of fact, my own sister had to miss school twice a week, every week to go and gather wood for my family. But at first, I thought this wasn't a problem for me to solve, until one day. I used to work for one of the biggest banks in Uganda as an accountant. In Uganda, after you finish school you leave your village and go to find a job in the city. So that meant that I was away from home for long periods of time. After six months without going home, I made the journey to go and see my mother. On my way home, I met my kid sister carrying wood on a day she was supposed to be in school. At first I wasn't surprised, because I also carried wood as a kid. But when she saw me, she started crying. She cried so hard that at first I got confused. I thought maybe my mother was sick, or something terribly wrong had happened to her. Or I even thought that maybe she was overwhelmed with joy because I had not come home for a long time. But when I helped her put the wood down and asked her, “Why are you crying?” she said, “I'm tired of missing school to gather wood.” She told me, “You see, all the forests here are gone, so the distances keep increasing. First of all, I can't go to school, but I am also physically tired of doing that. It's hurting me.” So I told her, “Don't worry. I gave her a promise. Let's go home. I will tell mother, and convince her to allow me to take you back with me to the capital city where I worked, and I will find you a boarding school where you don't need to gather wood.” She was happy, so we went home. But when I proposed this to my mother, she rejected it. She said, “All you guys are grown. I have five sisters, but all of them are married.” Most of them married between the age of 13 and 15. So she was the only one left at home. My mother said, “Do you want me, I'm an old woman. Do you want me to be the one going to find this wood?” So that failed. After my visit I went back to my normal job in the city. But I'm a strong believer in education. Education has changed my life. I wouldn't be here if I didn't go to school. And 99% of kids I started life with didn't get a chance to continue with education. When I go to the village and see the lives they live, it's so heartbreaking. Most of them look like five times my age. They have 15 children already. They are stuck in poverty there. So seeing my sister on the verge of missing the only opportunity she had to improve her life, broke my heart, and I couldn't sleep. I would see her at night in dreams, calling my name, asking me to help her, until I couldn't take it anymore, and I left my job. But I'm an accountant by training. I'm not an engineer. So my first question was, “What are you going to do?” But then I asked myself, “If I stay here in this bank, I'm busy all the time. I can't find time to research anything. Let me just go and see if I can find a solution.” Actually my boss, when he was signing my resignation letter, said, “Sanga, you are acting like a madman, but I am going to sign your resignation. Go and fail. I've given you a period of six months. If you fail, come back. Your job will be here.” I said, “Thank you, sir.” I went, but in my heart I knew I wasn't going to come back. So I went... The first thing I did is I went to one of the universities in Uganda, which I attended, called Makerere, and went to the engineering department, and looked for the professor that headed the engineering department, and told him that I was trying to find a solution to the energy crisis in Uganda. The first thing he told me, he said, “Young man, I am a professor. I know many things, but I have actually never done anything with my hands, so I also don't know what to do. But what I will do for you is I will give you literature. I have a lot of papers. I have magazines.” So he went to his office and got a box full of papers, and said, “Go and read. If you find something interesting, come back to me. I will maybe help you.” So I took the box and spent an entire week in the house, reading through these papers, until I came across an article that talked about some trials that were done in the Amazon forest where indigenous people were turning waste, like leafy materials, into fuel and fertilizers. That was very exciting to me. As a matter of fact, as I was reading through that I could see a pile of sugar cane waste outside my window. Uganda is predominantly agriculture. Everyone has a farm. They grow food, mostly subsistence. But there is a lot of waste that no one uses. We started with the 10 students. We tried many things that didn't work. I actually left the bank with about 1.5 million Uganda shillings. That's roughly $500. It was gone in like two months, and we had not really found a solution that worked. As a young man, I had bought a few expensive things, like a television set, a refrigerator, a sofa set, those things that when you are coming out of red you are like, If I first get my job, I will get all these things. I first watched some television when I was 15, so the first thing I bought was a television, because I had never really had a television. I went home and phoned a buyer, brought him to my house, said, “This is what I have. How much are you giving me?” I found a good buyer. He brought a pickup and took everything, and I had some money. The challenge came when my girlfriend came to visit...and found me in an empty house, and asked me, “What is the problem? Have you moved? You didn't tell me.” I said, “No, I sold everything.” She said, “Are you out of your mind? I thought you were mad when you left your job, but now I am totally sure you are crazy. You need to check yourself in a mental institution.” She slammed the door. I didn't see her again for six months. But the good story is, I got the money. I went back to the university, and with the help of those 10 university students, we built two pieces of technology. One is a kiln, and another one is a briquetting machine. I will be telling you about those pieces of technology later. But that was the foundation. And with that, I was able to start my company, Eco-Fuel Africa, which basically works with local communities to turn locally sourced farm and municipal waste into clean cooking fuel and organic fertilizers, and this is how the business works. The business is based on basically the two pieces of technology. One is a kiln. These are very basic pieces of technology. The kiln is made out of old oil drums. We go to slums and townships and collect or buy old oil drums, remodify them and give them a chimney, and design them in a way that limits the amount of oxygen that goes into the combustion process. We go back to the villages, find farmers with the help of local leaders, train these farmers how to use these kilns, and after the training we give them a kiln on a lease to own basis. The farmers take these kilns back and start converting their farm waste into a powder. We call this powder a char, and we teach these farmers to sieve this powder on screens. Approximately 80% of the powder they make goes through the sieve, and we buy that from the farmers. The coarser portion that remains on top of the screen can be used-- We teach farmers how to mix that with compost, and they can return it to their gardens as a fertilizer called bio-char. So they don't have to buy fertilizers, and they can renew their soils and increase their soil fertility. As a matter of fact, recently we made a survey, and most of these farmers were able to increase their harvest by over 30% using these fertilizers. After buying this powder from the farmers, we take it to our production facilities. We built a number of production facilities in these villages, where we use the briquetting machines that the students helped us build, to compress them into briquettes that people can use to cook. Our briquettes are 50% cheaper than traditional charcoal from wood. 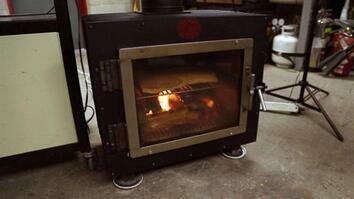 They burn cleaner, and they burn 30 minutes longer compared to wood, so people can save money. Users of our fuel save about $200 a year, because of using this fuel. Because of that, they can cook regular meals. They don't have to deplete forests to cook food, and they don't have to suffer from indoor air pollution. But we don't sell our fuel directly to the consumers. We've created a distribution network where we work with local women to sell this fuel back to the communities. These are everyday women. We go to these communities. We talk to local leaders. They help us identity marginalized women. Most of our women retailers are single mothers, widows, people who would not ordinarily find any other job, have no marketable skills. We train them and build them a well-branded kiosk, which acts like a one-stop shop center... I think my English is right. ... in the village, and people can come and buy fuel, but we also allow them to sell other things like tomatoes, oranges, food, so that people get that one-stop center shopping experience. It makes it easy for them to sell enough briquettes. We've already created 460 women retailers in these communities. These make about $152 a month in income. This is middle-class income actually in Uganda. It's more than what the government of Uganda pays primary school teachers, for example. With this income, these women can send their children to school. They can buy food for their families, take their children to hospital, and improve their livelihoods. We have made some strides. We started from scratch a few years ago. We now have over 2,500 farmers with our kilns, the kilns I showed you, that supply us with the char. We have 460 women distributors, and over 100,000 people use our fuel on a daily basis in Uganda. But we are still a drop in the ocean, because currently our biggest challenge is the demand for our fuel exceeds our supply by far. Uganda has 35 million people. We are now reaching only 100,000 plus. We are still very small compared to the demand out there. The biggest challenge we have is that Africa has an infrastructure problem. Some of these villages cannot be accessed. There is no road. So people come from a village and say, “We want your fuel.” But there's no road connecting to that village. So that has been a challenge, how to collect all that. But I want to thank National Geographic very much, because last year they gave us a grant that helped us rethink our business model. We created something called franchising...which helped us, micro franchising. It's not a term we created, but the model, we call it micro franchising. Micro franchising basically enables us to eliminate shipping and transporting things over long distances. It enables us to decentralize our production. We go to villages. We find local people who can manage this business. Because there are so many scattered production centers we can't own all of them. We will become insane. So we empower local communities to manage those businesses. What National Geographic did for us is they gave us money to create a revolving loan fund that enables us to provide the technology those communities need to launch these micro businesses, and within six months they pay us back, and then we go to the next village. With this, we think we can reach over 100 million people, that is slightly over 16.6 million households, by the year 2030, stop deforestation, stop indoor air pollution, and change the world. I invite you to our journey. Thank you very much.